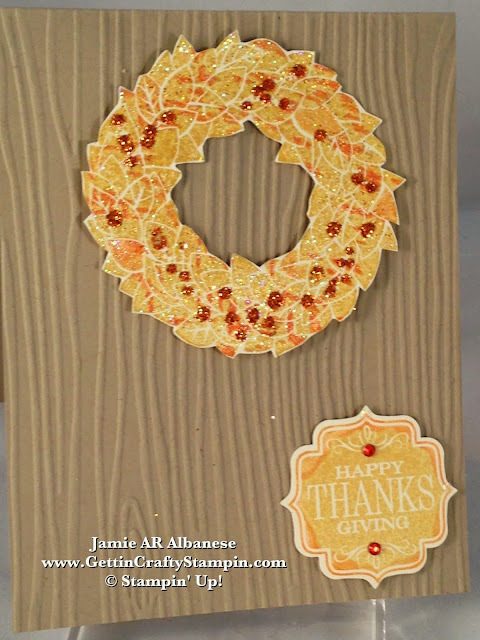 Getting Crafty with Jamie: Have a Wonderful Wreath this Thanksgiving! Have a Wonderful Wreath this Thanksgiving! FALL IS HERE!! It's Time... Go For it!! Whip out ALL of your Fall decorations (even the ones you were intending to pull out and hadn't yet), Start that Oven and Grab those Pumpkin Bread recipes off of Pinterest!! Yipppeee... it's Fall and it's going to Sparkle with the changing of colors, cooling of weather, upcoming celebrations and the work-outs required to burn them off - eek!! What do YOU Think?!? Leave me a comment and let me know. Share this, Pin, Email, Facebook, Tweet, Google+ this, Follow Me there and on YouTube, Instagram, and The Vine. Prepared for the Holiday Season?!?! Join Me with a Fun Selection of Classes that will prepare you, in person or virtually! Here I wanted to embrace the cooling of weather, changing of leaves, and sparkle that fresh changing leaves embraces. Can't you just smell the beginnings of Fall?? This Wonderful Wreath stamp set (#132748 Holiday pg. 34) can cover all of the seasons. Here it celebrates the start of Fall! The Color Coach (#130118) is a favorite tool of mine! It pairs great combinations so that you can have a new look with the colors you currently have. 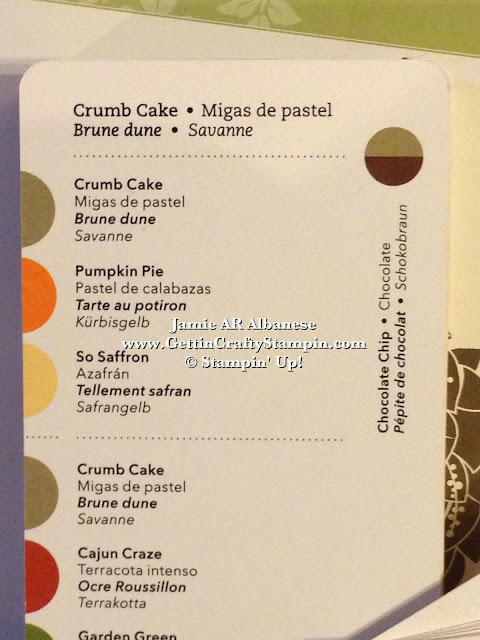 Grabbing my Crumb Cake card stock (#120953), Very Vanilla card stock (#101650), Pumpkin Pie Stampin' Write Marker (#105115), and So Saffron Ink (#126957) this card comes to life! Inking the Wonderful Wreath in So Saffron, then accenting a couple of leaves with Pumpkin Pie ink, taking the marker and thumping the edge (see the Video Below on how to add color with this cool technique) you'd be amazed at how it comes to life and toasts Fall! Huff on the inked image, stamp and liberally cover with Iridescent Ice Stampin' Emboss Powder (#101930), if done when freshly stamped, quickly, and heat set with our Heat Tool (#129053) for an additional sparkle and bling to this card. Using Crystal Effects (#101055) to add dots of liquid glue, cover with the Orange Stampin' Glitter (#132206 Holiday pg.20) for More BLING (baby!!). Pops of Color and Sparkle, oh so fun! Rock N Roll this Fall!! Ok so this technique (see the video below) is a great way to add an umbrae look that is oh-so popular right now. Adding a variegated look is easy and sure to wow. Add Color and MORE bling in an accent with our adhesive-backed Rhinestone Basic Jewels (#119246) that I colored a bold orange with a permanent marker. I love that you can change up the look of these stones or pearls oh-so easily!! Pulling it all together, thanks to the Color Coach's help, this Crumb Cake card (embossed with a fun Woodgrain embossing folder (#127821) and my Big Shot (#113439) for texture. I tend to go more towards nature when the Fall Season rolls around, lol. Like a front door or a stunning tree and it's leaves in a beautiful crown, this card is sure to warm up anyone's day. Thanks for coming by! I post daily and hope to see you often!! I can't wait to hear what YOU think of this card and my blog! JOIN the Exclusive Gettin' Crafty Stampin' Mailing List for some AWESOME Tutorials and BONUS Projects.. Soon Starting 12 Weeks of Christmas emails. Weekly emails and Exclusive Projects for those on my Mailing List ALONE!! Toast Fall with me! Raise your mug of Spiced Cider and smile... the weather is cooling, holidays are a coming and baking is soon to happen!! I hope that your Fall Sparkles and that you see the Jewels in the changing of the leaves. Bling it up this Fall! Whip out those knee high boots, colorful scarves and coats... Yipeee! Hello Fall! !